It’s all go behind the scenes here and in fact I have had very little time to even get a decent walk in recently as the highest priority is to now complete the final few fells and piece together the text and sketches for the book. As you may know, the whole project has been undertaken from the start by me alone, sort of doing it the “Wainwright” way. Every photograph, sketch and frame is produced by me and this also applies to the book. Granted, I am not designing every single page in a notebook first but this is basically done in a software program in the computer, once the size and format of the book was decided I then had to fit all the sketches, as near as possible to scale and wherever possible in the order that they appear in the Pictorial guides, quite a big learning curve for someone who had never even used this progam before now. Still, after much trial and error it is all now slotting nicely into place. Each sketch has it’s own title, date and any point of interest. Very few of the fells actually fit easily into one page and part of the challenge has been to give the overall look of the pages a balanced but not cramped feel. In fact, this is very similar as to how AW tried to design the pages of the Pictorial Guides, no space was wasted, small gaps were filled with notes of interest or maybe the smallest of sketches. 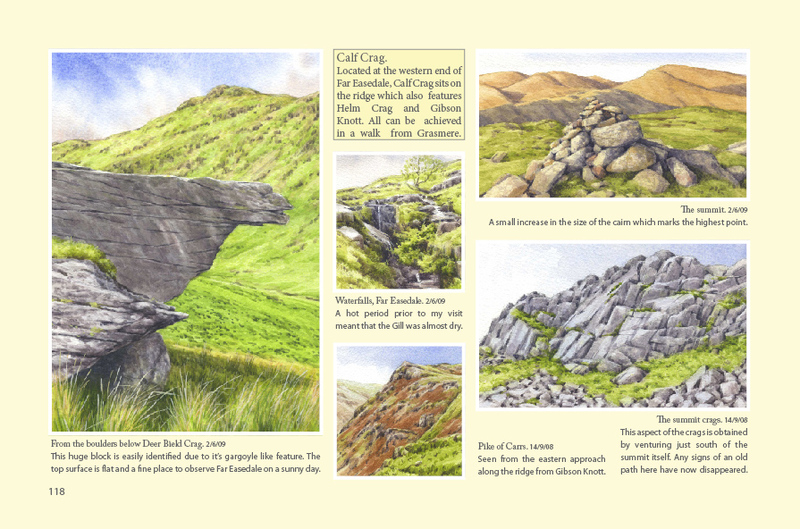 This page of Calf Crag is just an example of how the layout every page will look. I have included the dates of exactly when I obtained the reference photograph purely to show how the scene looked on that day as obviously even in the past couple of years cairns etc will have changed somewhat. On several pages there is some spare space, these sections are being filled with some extra text which I had not planned on including, interesting snippets about the fells as they are today, features which we take for granted and how certain elements have changed over the years. It is these inserts which are taking up extra time for me and delaying the publication date of the book. In total this work will have taken me in access of 8 years to complete and this book will be the final chapter (sic) in this whole process. I fully understand that there are those of you who are eagerly awaiting the publication of this book, in fact I receive emails on an almost daily basis from people wishing to be added to the list to purchase a copy, no-one more than me but my target is to produce the very best product that I can, rushing it will only lead to errors and that is something I can’t allow. I thank you for your patience and hope you understand the delay in the publication of this tome.